Add ingredients into Vitamix blender in order listed. Blend on high for 30 to 45 seconds until you reach the desired consistency. 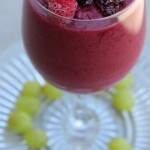 To make it thicker, add more frozen berries or ice 1/2 cup at a time until desired thickness. Looks delicious! I haven’t tried using coconut or almond milk before. Elise, you’ll love it! Coconut and almond milk have great nutrients in addition to making the smoothie more creamy. Let me know what you think!